We have moved, our new location is 134 Hutt road Petone, just up the road from our old location. Welcome to the official website of Electric Motor & Generator, [Formally Petone Motor Winders & Electrical Ltd]. Thanks for stopping by. 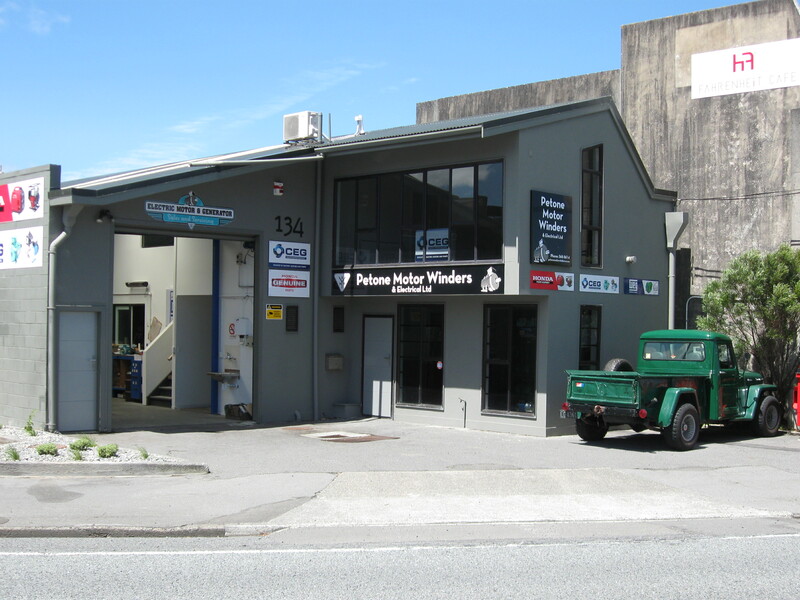 Electric Motor & Generator Ltd are your industrial and marine electric motor and generator experts, Servicing the greater Wellington and Wairarapa region. The team at EMG offer full servicing of electrical rotating machinery, both electrical & mechanical repairs on all types of machinery. Re-winding of all types and sizes of electric motors and generators, Diesel and portable petrol powered generators, AC & DC, Elevator/escalator motors/generators, Airport ground equipment, Military spec generators, Spa pool/Swimming pool and Industrial/domestic water pumps, Welder repairs. We are agents for CEG Motors and Pumps, Weg Electric motors and Variable Speed drives/Soft Starters, Brook Crompton W Series Electric motors, Honda Power Equipment/Garden & Outdoor equipment, Honda generators sales and servicing, Lamb Vacuum motors, Fasco single phase motors, Air Over motors. The Team at EMG has stock and access to a complete range of electric motors & associated equipment. We are the Honda Generator experts. Come to us and we will have all the answers. Complete Honda Engines, Lawnmowers & parts, Honda Ride-on mowers, Honda Four-stroke Brush Cutters, Hedge Trimmers, Blowers, Honda power carrier, Rotary Hoe, Honda Post Hole Borer & Augers, Honda Pumps, Honda spare parts. We are also members of EASA, Electrical Apparatus Service Association, all work carried out to the EASA recommended practice for the repair of rotating electrical apparatus.All staff members are registered Electrical Workers in their field of expertise . We are your Electric Motor Re-winding specialists undertaking all electric motor/generator repairs, both mechanical & Electrical. With over forty years working in the industry and 29 years in business. The team has a combined experience of fifty-three years servicing the greater Wellington region. We guarantee all our work, Quality Assured. Contact the team at Electric Motor & Generator to learn more.